What is this succulent plant? 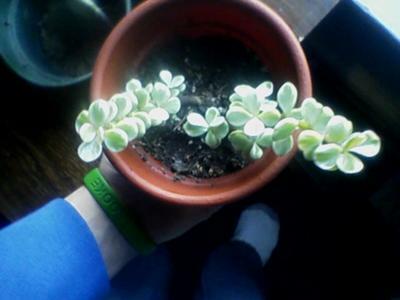 Its a pale greenish color, my school gave them away, and even they had no idea what it was. Its waxy, some of the leaves have a pinkish or purple edge around them at the top, I love this plant and I want to find out if it ever makes seeds or if u can take a leaf off and start another plant? or just where to get a new one. Comments for What is this succulent plant? Hi Jeff - I think what you might have is a Pepperomia. There are many kinds, but that's a place to start. Apparently, they will root from a leaf, or you may have better (and quicker) results with a stem cutting. For more information on how to do this check out the Succulent Plant Propagation page - who know, you may decide to buy my Succulent Plant Propagation E-Book for even more tips and techniques. What a great way to get you started on a collection of succulent plants! 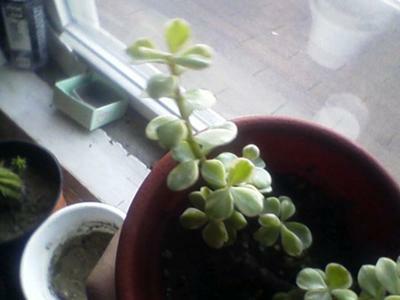 This plant may be Portulacaria afra, aka elephant food. Young stem cuttings will root quite easily.